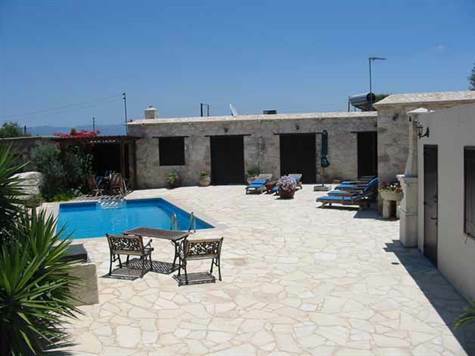 Polis Chrysochous, Paphos - A four bedroom traditional stone built villa with a pool in a beautiful stone paved courtyard. The main house has two bedrooms which share a bathroom, a fully furnished kitchen (washing machine, family sized fridge/freezer, microwave and electric oven). The house has a wood burning fireplace in the living room/dining area with TV and furnished to a high standard. The other two bedrooms (of which one is en-suite walk-in shower) are adjacent to the main house.